Baby, it’s Just a Big Bird! 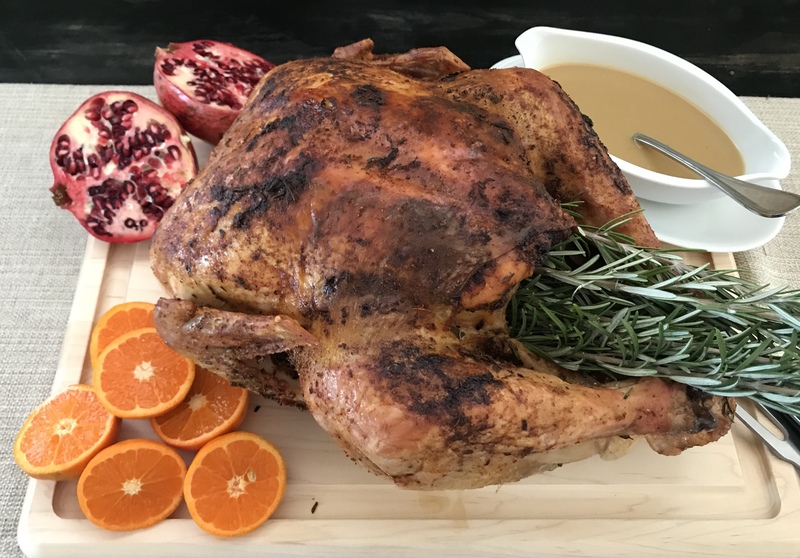 I know that the roasted turkey can be daunting for many home cooks when Thanksgiving rolls around, but there’s no need to fear it—it’s really just a big chicken! And I’ve shared many of my favorite roast chicken recipes, so if you’ve followed along this should be easy-peasy! The key is in the planning and timing. And of course a good quality product. Many thanks to D’artagnan for using only the best–plus they’ll ship it to you! Your goal is to have a turkey that’s salted and golden brown with crispy skin. That’s why I use the Russ Parsons’ dry-brine recipe. It was recently featured in the New York Times as a better options than the wet brine method. In addition to adding flavor to the otherwise bland bird, the brining will also reduce your cooking time significantly. We were able to get the perfect cook on a 14-pound bird in just about 2 hours! Another area of concern when the bird is perfectly cooked, is the cutting of the Turkey. 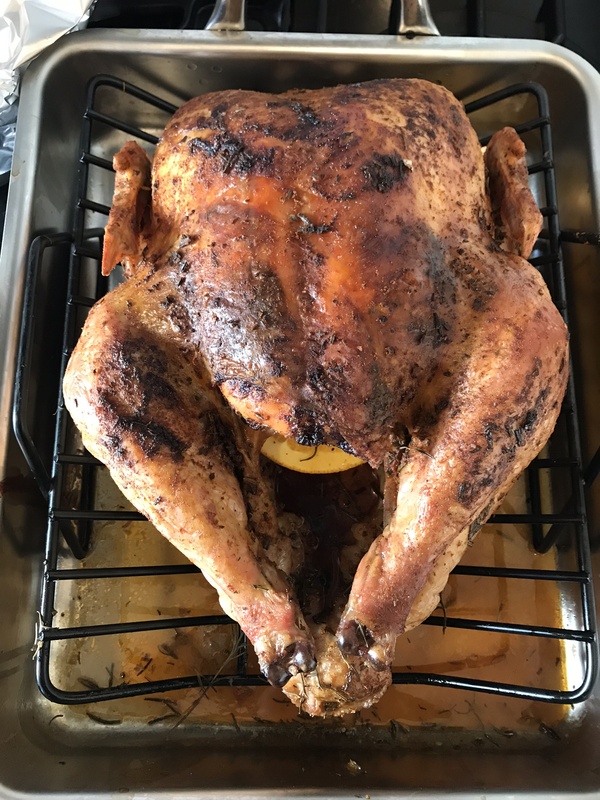 While I often allow my husband to get to the nitty gritty, I think it’s a skill that anyone who’s daring enough to cook the bird should know. I recommend looking up tutorials on YouTube, and start by removing the breast whole. You want to make sure that you don’t massacre the turkey now that you’ve created the perfect Thanksgiving dish. If you’re wondering about that beautiful cutting board, like the brining recipe, that too came from Food 52! Remove turkey neck and giblets, place into a pot with 4 cups of water, and bring to a boil. Reduce heat and let simmer for at least an hour, and up to 6 hours. 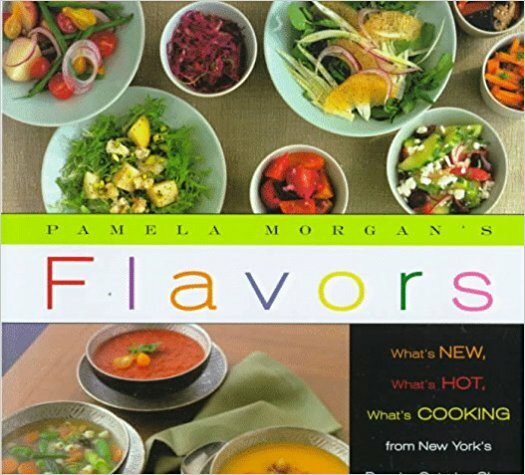 When you're happy with flavor, discard the neck and giblets, strain and cool liquid. Refrigerate for use when making gravy. Wash the turkey inside and out, pat it dry, and weigh it. Measure 1 tablespoon of salt into a bowl for every 5 pounds the turkey weighs (for a 15-pound turkey, you'd have 3 tablespoons). Flavor the salt with smoky paprika, thyme, and rosemary. Grind together with the salt in a spice grinder, small food processor, or mortar and pestle. Sprinkle the inside of the turkey lightly with the flavored salt. 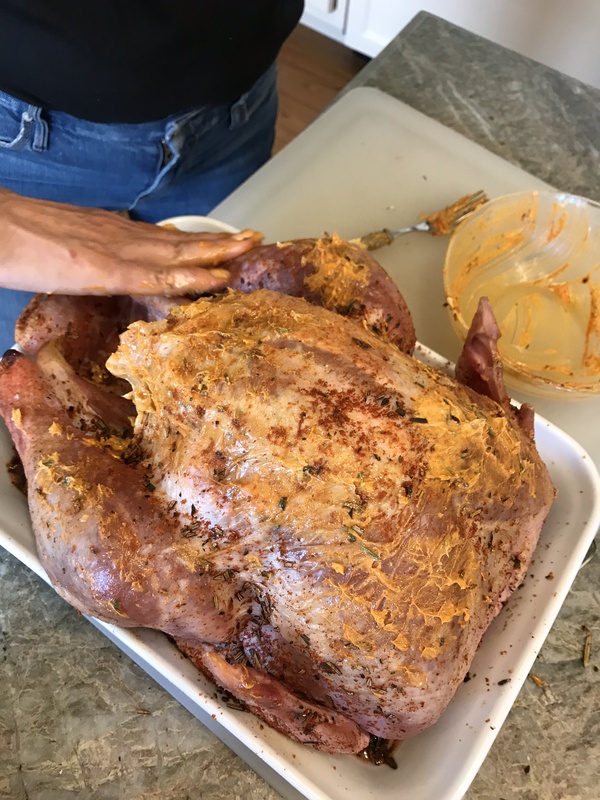 Place the turkey on its back and season the skin of the breasts, concentrating the it in the center, where the meat is thickest. You'll probably use a little more than a tablespoon. Turn the turkey on one side and sprinkle the entire side with salt blend, concentrating on the thigh. You should use a little less than a tablespoon. Flip the turkey over and do the same with the opposite side. Place the turkey in a 2 1/2-gallon sealable plastic bag, press out the air and seal tightly. 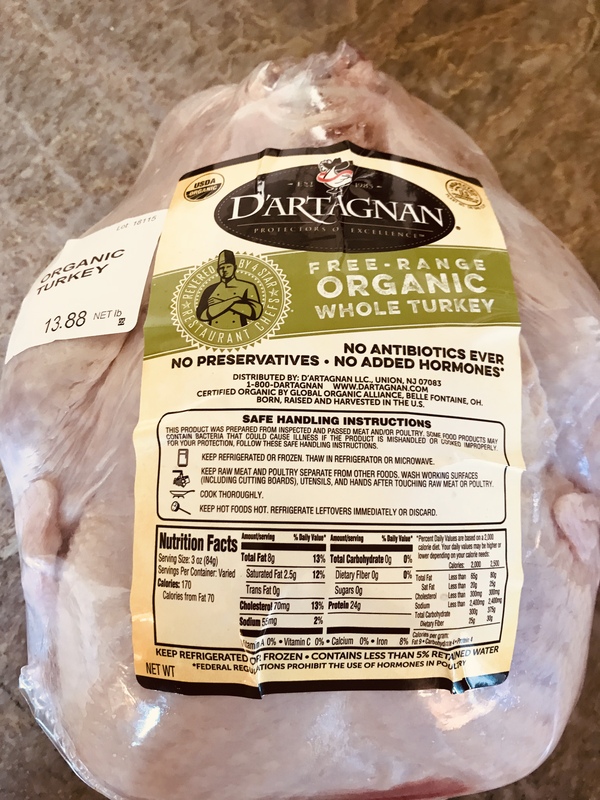 (If you can't find a resealable bag this big, you can use a turkey oven bag, but be prepared for it to leak, or wrap the bird in a few layers of plastic wrap.) Place the turkey breast-side up in the refrigerator. Chill for 1-3 days. Rub the seasoning around once a day if you remember. Liquid might collect in the bag as you go—this is normal! 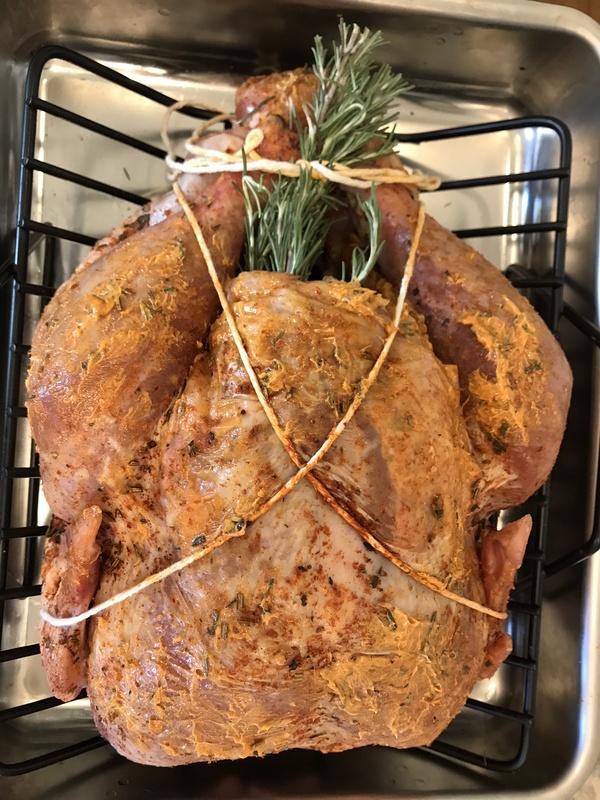 On the day it is to be cooked, remove the turkey from the refrigerator and leave it at room temperature at least 1 hour (do not rinse—it's not needed, and rinsing will make the skin less crispy). If you're concerned with the saltiness, you may wipe the bird with a towel, which will remove the excess salt. 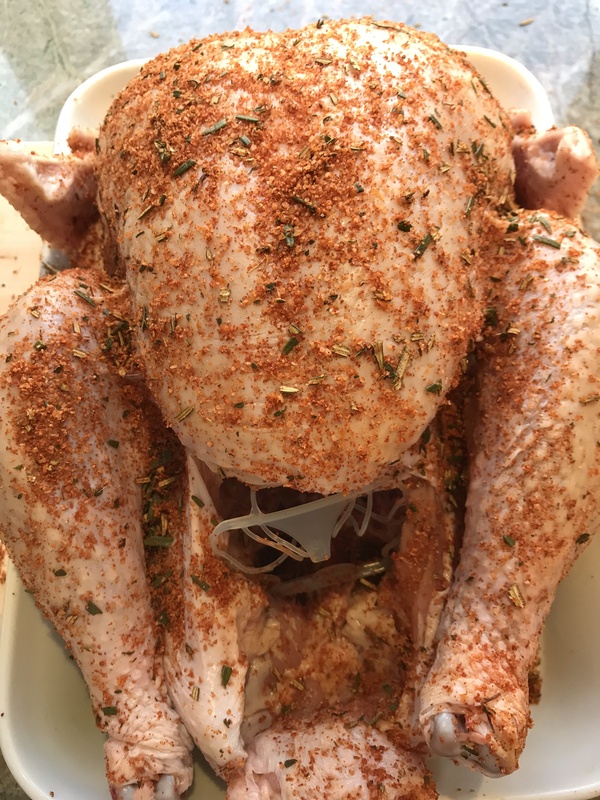 If you choose to do this, then you can sprinkle some more herbs over the bird before you put it in the oven. In a small bowl, stir together the butter, rosemary, orange zest, and smoky paprika. The butter can be prepared up to 3 days ahead and refrigerated, or frozen for up to 1 month. Soften to room temperature before using. Position a rack in the lower third of the oven and preheat to 325. Set the turkey on a rack while in a shallow roasting pan just large enough to hold it comfortably. 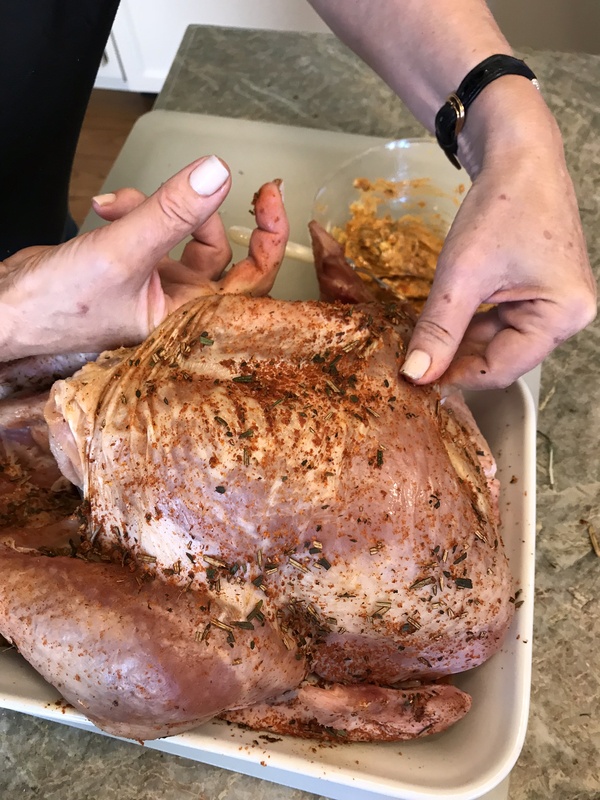 Working from the vent end of the turkey, carefully slide your fingers between the skin and the meat of the breast and thighs. Spread about three-fourths of the butter mixture under the skin of the breast and thigh meat. Rub the remaining butter mixture over the turkey skin. Season lightly with salt. Set the turkey in the oven and roast undisturbed for 1 hour. Add the stock, wine and orange juice to the pan. Tilt the turkey to combine any melted butter mixture from the cavity with the pan juices. Roast the turkey, basting it every 10-15 minutes with the pan juices, adding a cup or so of water to the pan if the juices eventually evaporate, until the skin is richly browned, and the dark meat remains juicy, another 1 hour. An instant-read thermometer inserted into the thickest part of the thigh should register at 160 to 170 degrees. Continue to cook in 15 minute increments if it's not at the correct temperature. Transfer the turkey to a cutting board. Tent the turkey with foil and let it rest for at least 15 minutes before carving. Reserve drippings for gravy. Heat turkey broth over medium heat. Remove drippings and pour into gravy strainer, to separate the fat from the juices. Pour into a bowl and mix in orange juice and butter. Whisk in flour until smooth, add more flour, if you prefer a thicker consistency for your gravy. Slowly add the thickened dripping mixture into your turkey broth, until you reach desired flavor and texture. 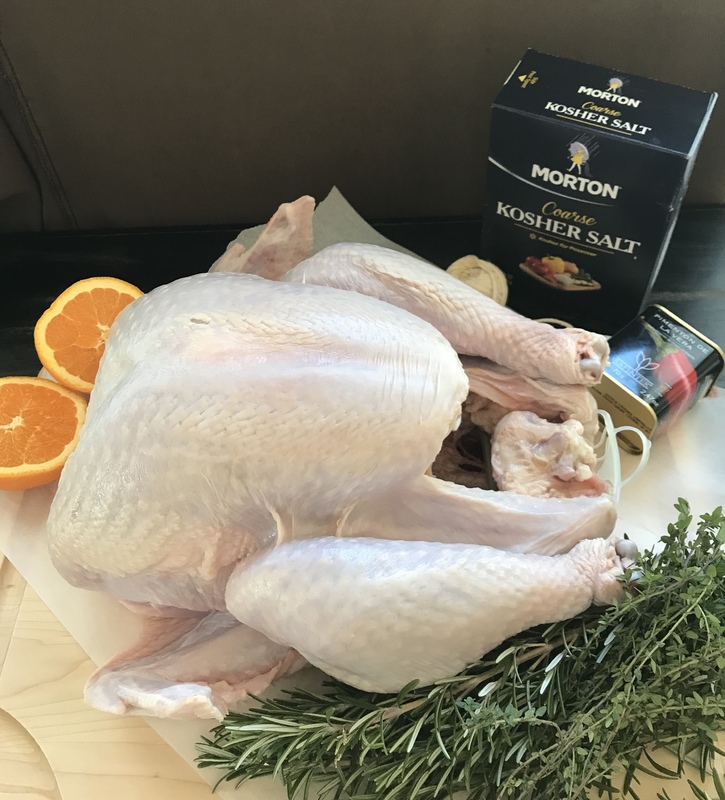 Please note that the brining process will create a very salty pan sauce, which is why you want to use is as a flavoring and thickening agent, rather than the base of your gravy. Serve with roasted turkey.